Blue and red color coding helping drivers remember which way to go. Left (blue) for the Tomei Highway, right (red) for the Inner City Highway route. These colors were also followed through on the road below to help drivers steer their course. It was raining outside, but inside the tunnel the weather was fine and quite warm. At ground level the road looked really clean. Inside the tunnel it looked as if Disneyland had been set up. Looking back down the Yamate Tunnel towards the entrance. Some of the illuminated archways people could walk through. The colors on the arches changed every few seconds. A display of lights also was shown on the roof of the tunnel. Inside the tunnel it seemed like a Christmas illumination show at times. Plenty of people were taking a look at the many rescue trucks on display. There were various demonstrations being given. This one was showing people how to use the tunnels manual fire hose systems. As the tunnel curves around it gets quite wide. The sliding fire escape door which leads to the emergency stairs. Bumped in to @lhuga and her crew whilst in the tunnel. The tunnel splits between heading for the Tomei Highway and the Inner City Highway. Up ahead you can see the existing highway where the tunnel traffic can merge onto. A good opportunity here for people to get a souvenir photo in front of the official sign. Looks like we have a broken down vehicle in the left lane here. Nice large crash barrier looking very clean. Lets hope no one needs to use this. Getting the chance to ride in the fire truck had many people lining up. This was probably the most popular attraction. Let's hope that not too many people need the fire truck called out to them when they are in the tunnel. A few uniforms waiting for the next group to try them on. Displays by the fire crew allowed you to sit in the fire truck and also try on some of their protective clothing. Fire Chief at your service. The Love Tokyo sticker on this fire truck looks great. One of the many patrol cars. This Mazda 8 police car was getting quite a lot of attention by people. A police bike gets checked out. The Tokyo Smart Driver sticker looks good here. The Tokyo Rescue logo on the fire and rescue truck. These bikes are special patrol bikes for checking close up what is happening on the route. These are not police opearted by the police but by the Highway company. A very colorful display set up in the middle of the tunnel. Walking back down the tunnel passing through the illuminations. There was a video racing game set up for the kids with the screen projected on to the tunnel wall. The sound of the racing cars echoed through the tunnel which was a nice effect. The 3km walking course set up inside the tunnel. Mr ETC made an appearance in plastic form. I hadn't seen this character before except on TV. Lots of photos being taken of this Highway character. Not sure why he has the mask on. Maybe to cut down on the exhaust fumes? A closer look at the Highway character. Like his hat. Nice clear signs above and color coded markings on the road make it easy for drivers to see which lane they should be in at an early stage. Some of the pictures taken during the construction phase had been projected onto the tunnel wall in black and white. Nice effect. The construction calendar shows the progress points for the Ohashi Junction work. A scale model of the Ohashi Junction and highway. A closer look at the calendar showing construction progress, including some pictures of the various stages completed. Displays on the tunnel wall showed what type of equipment had been used to help construct the tunnel. This picture shows the large cutting shield machine, which weighs the equivalent of 11 jumbo jets! One of the components that make up the huge cutting machine which carved the tunnel. A few folks getting a closer look at the cutting machine. A school orchestra provided some music and entertainment inside the tunnel during the day. The children's orchestra gets ready to play. The Omedeto sign is missing a character in the middle. Also, I thought it was o-me-de-to-u, not o-me-de-to-o, but then realised that these signs are printed on both sides for people to read walking in both directions. One of the many sensors in the tunnel to look for any sign of trouble. The cable and box running to the machine that checks for the sign of any changes in the tunnels structure. The tunnel looks a little narrow here, but once you get further down it widens out quite a bit. These devices help to send back signals showing whether the road is crowded or not. That information is then used in the VICS road reports which can tell you in advance whether to take a different route. Breakdowns can be called in from these phones that are places along the way. Can you make out what kanji sign I have the camera sitting on top of? SOS calls can be made through this phone. Loads of red on display and a few face masks in the crowd as well. 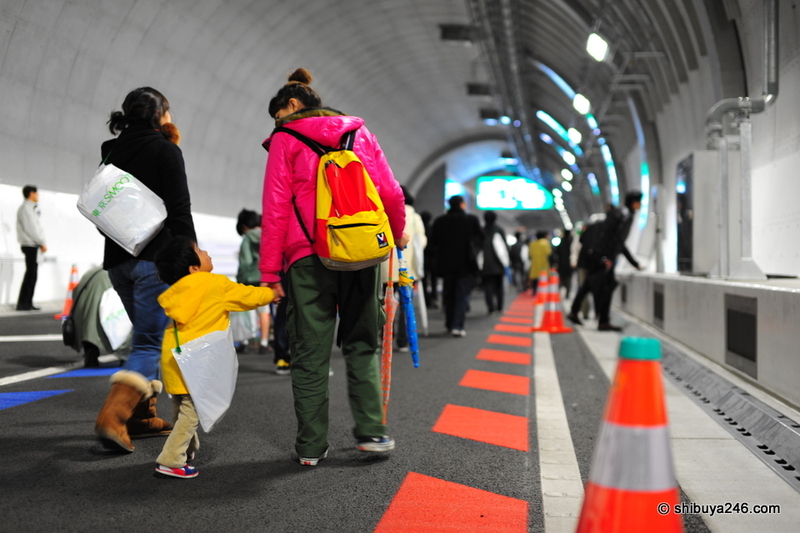 At times the traffic in the tunnel was getting quite crowded just with pedestrians. Once the cars roll threw it will be a different scene. Everyone was keeping to the main asphalt track and not crashing in to the cones or wall. Recognize anyone in the photo here. Strange who you bump into in the Tokyo tunnels. I liked the image of the child running down the road while everyone else is getting into their lane. A very clear sign here. A little bit of traffic crossing the sign. Straighten up guys! Looks like these guys didn't notice the direction of the arrow. Got to admire Japanese construction for that, wish they cared for their work as much here and were as diligent. Over here tunnels look like a dirty, dilapidated mess even when they’re new and are never that clean to begin with. I thought the same thing, good and clean. If they could just spread that too in EU! Another unique experience. Thanks for keeping us in the loop – literally! very nice lights, are they going to keep them or is this only for promotion? how long is this walk for a person? I was incredibly struk by the power of the colors. This looks like a pro shooting session, I am really impressed. Most of the frames catch perfectly the spirit of the event, again A+ on that man! How many pics were actually taken that night? Don’t think I’ve ever heard of events like this here in the US. Very interesting stuff. http://bit.ly/a2qW2a Looks exactly like a Disney set up. Maybe Tokyo Disney did help w/the light set up. Another great photo shoot. We do not have any tunnels to go through. Just miles and miles of free ways. Sometimes they let the people walk across a new bridge but that’s about it. who is that women in that group photo you took? don’t reconize her. And everythig is so shiny and clean. Everyone looks like they are having a great time. Even the equipment is shiny looking. A huge Domo Arigato to you for a wonderful photo shoot everything matches perfectly. Cool photos. 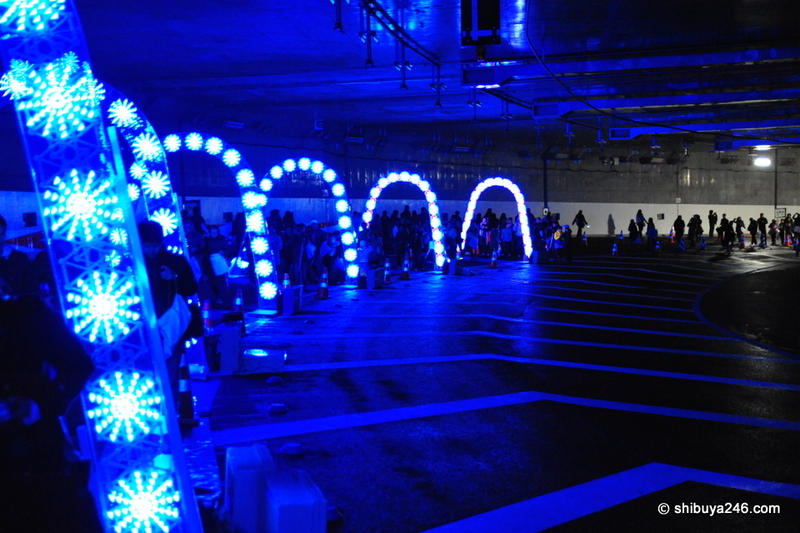 The light displays set up in the tunnel look remarkably like the ones set up by the Tokyo Dome around Christmas time. Wouldn’t surprise me if they’re the same one. Very interesting, I didn’t know about this kind of event. I will always be “bikkuri” by Japan.